Welcome to the burgeoning world of dental tourism where Aussie travelers hunt down dazzling smiles at dirt-cheap prices. 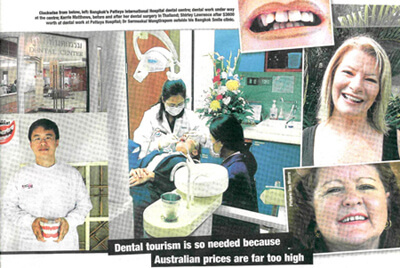 MELENIE AMBROSE and LEISA SCOTT report on what’s becoming a booming business for Asian dentists and Aussie tour operators. FLICK through Kerrie Matthews’ family photo albums and you’ll see a lifetime of happy memories - just not too many big toothy grins. For most of her adult life, the 50-something, semi-retired mother-of-one kept her teeth firmly hidden whenever a Kodak moment arose. A lifetime of dental mishaps, including broken teeth from chewing her baby’s fingernails, had left a sizeable dent in her self-confidence. At the time she was running the 90-room Overland Motel in Kalgoorlie and being able to offer guests service with a proud smile would have been a nice feeling. Enter a Filipino housekeeper, nicknamed “Babe”. “She worked for us and had beautiful teeth- done in the Philippines. So I surfed the net and found Aussie Dental Tours and Decided to go to Bangkok, a place where I had been on holiday before,” says Matthews. The toothy tour cost about $7000 all up and Matthews believes it saved her $13,000 on Australian dental bills. The final laser-whitening step was accompanied by a half-hour-long soothing foot massage. “I came back with the biggest recommendation,” says Matthews, whose big reveal at Kalgoorlie airport in December 2005 led to “lots of double takes” from her partner John. Of course, Matthews is not alone in her pursuit of pearly white perfection while on an overseas holiday in Asia. She join thousands around the world now making the pilgrimage in search of bargain-basement dental deals, seduced by the noting of getting a bit of work done at a fraction of the cost back home. Fellow Aussie Gary Flowers, 45, from Brisbane, liked what he saw so much that he wanted a part of the action. In 2001, working as a building surveyor in Singapore, Flowers would fly to the Philippines for dir-cheap dental work. Some serious research and a small business course later, he had set up Aussie Dental Tours with his Thai-born wife, Chanphen, and accountant. Sermsakul studied for his degree and graduate diploma in Bangkok before picking up his diploma in dental implants from the University of California, Los Angeles. For Flowers, the lure of so-called dental tourism is obvious – it offers a saving of up to 70 per cent on prices at home, plus there’s a holiday to boot. Dental veneers which normally cost $1000 are just $330, $4000 implants go for about $1350, crowns come in at $350 instead of $1000, and fillings mere $30 instead of $100. Catering for visitors on anything from a champagne to beer budget, Flowers and his small team organize seven-day to 14-day escorted tours to Bangkok and Phuket. Seasoned travelers can score an appointment and information pack for less than AU$100. On the streets of Bangkok, 51-year-old real estate agent Joan O’Neill, from Queensland’s Sunshine Coast, is getting a first-hand feel around the Thai streets as she awaits her turn in Dr Bob’s dentist chair. 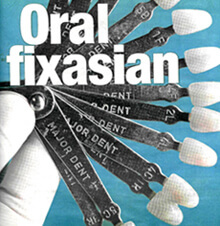 The fact that Australia is in the grip of a major dental dilemma is also a hot topic. The nation is now rated second-worst among OECD countries for adult decay and there is a chronic shortage of dentists nationally. A grim prediction shows we could still be down 1500 dentists in another four years. The reasonable conclusion for many is that the basic law of supply and demand is factored into the pricing policies of Australia’s private clinics, overwhelmed by patients. It’s a theory denied, however, by the Australian Dental Association’s CEO, lawyer Robert Boyd-Boland. He argues that prices have risen only in accordance with the cost of health provisions. Liz Coates, who chairs the Australian Dental Foundation’s Infection Control Committee, concedes many people believe Australian dentists overcharge but, like Boyd-Boland, she maintains that prices are reasonable, especially given dentists’ length of study and the type of service. Bangkok Smile, meanwhile, is keen to point out it has a strict system guarding against cross-infection. It uses the “Autoclave system” of sterilization which includes de-bugging hand pieces at 135C – important hygienic factor, according to Coates. Coates concedes there are excellent dentists in Asia and that even at home there are some not-so good practitioners. “I would just be very selective about who I went to in Asia whereas in Australia, 90 per cent of the time, I could be a lot less selective,” she says. Still, toothy tourists like Shirley Lawrence, 49, from Morley, are overjoyed to jump the long waiting queues on home soil and pocket the extra cash saved from cheap dental holidays. A surgical nurse at a top Perth hospital for more than 20 years, Lawrence had seen her fair share of medical disasters from problems including staff shortages and dodgy doctors. Costing AU$3600, the dental overhaul included eight veneers (normally costing AU$1000 EACH in Australia), new white fillings and teeth whitening. Meanwhile, upstairs in one of Bangkok Smile’s compact consulting rooms, hawker-wear Queenslander Joan O’Neill is deep in dental crisis talks. Armed with X-rays that initially sent her into a spin, and down on Australian dentists, she discusses her options with the specialist, Dr Sunisa Juengjitrak. For an agonizing six years, O’Neill has suffered teeth problems and had desperately sought out Queensland dentists trying to find relief. Before deciding to check out Thailand, she had spent a total of $12,000 on extractions, root canal, crowns and bridges. Won over by her new-found dentist’s “thorough and caring” manner, she makes the leap and decides on five dental implants, including two in the place of bridges she will have removed. O’Neill hates how food gets stuck underneath a bridge, another name for a false tooth that is attached to teeth on either side but no embedded into the gum. Implants are a more aggressive form of tooth replacement but leave adjoining teeth untouched. A dental surgeon implants a titanium fixture resembling a screw into the jawbone to act like the root of a tooth. Queenslander Joan O’Neill laughs at lame jokes suggesting she’ll look like him when she’s finished her appointments at Bangkok Smile. “They are brilliant. They just listen and they’re so quick and efficient and gentle,” she says. Plus she loved the complimentary foot message she received during the teeth whitening. The other drawcard – that the clinics stay open into the night and on weekends to satisfy foreign clinets. Wearing her new T-shirt emblazoned with the slogan “Care-U-Teeth”, the medi-tourist sits with her traveling buddy, her sister – quieter yin to O’Neill’s theatrical yang. The pair reminisce about their adventures so far in the Land of Smiles. They’re chuffed with mastering the Bangkok Sky Train and love it every time Nana station is announced because it cracks them up and makes them giggle like schoolgirls. Armed with bags full of treasures, O’Neill is an all singing, all-dancing advertisement for medical tourism. She can’t stop smiling and is so excited at the prospect of finally reaching her dental nirvana. As for Aussie Dental Tours’ other client, former Kalgoorlie motel owner Kerrie Matthews, she’s now use to being constantly quizzed by acquaintances over “where she’s been” as they try to fathom the source of her new glow. The former smoker (she kicked the habit after 25 years) has only one task left to complete. “Learning to smile again with confidence,” she says with a grin. Looks like she’s already halfway there.